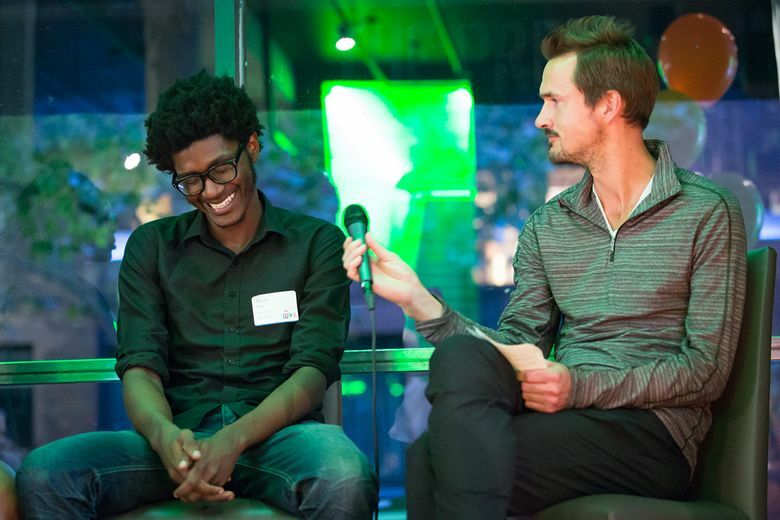 Xavier Wade, left, is interviewed by former Seattle Sounders FC great Roger Levesque during Juma’s 2017 annual event. Once one of the nearly 24,000 youth in King County not in school and not working, Xavier Wade got the training and support he needed to succeed. His first lesson? How hard it is to find work without so much as a high school diploma. At the time, Xavier was one of the nearly 24,000 youth in King County who are currently not in school and not working. They lack the resources, skills and confidence needed to successfully transition to adulthood. Unless they get training and support to overcome these barriers, they will remain trapped in a cycle of poverty. That led him to enroll in a G.E.D. program where he learned about Juma, a nonprofit social enterprise that provides employment to young people so they can get training and experience while building job skills, as well as the opportunity to connect with education and career pathways. Xavier says Juma “helped me learn about handling responsibility.” For one thing, working at CenturyLink Field required a long two-hour bus commute, demanding time management and commitment. He worked with Juma, continued his G.E.D. and, through the Juma program, he participated in workshops as well as an internship.